Mexico's state-run energy firm Pemex says it is still searching for three workers who went missing after a fire at an offshore oil platform. Four people were killed in Wednesday's fire, the cause of which is unknown. 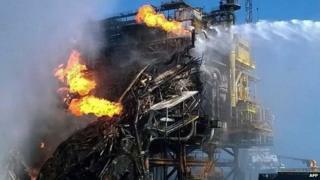 More than 300 workers had to be evacuated from the rig in the Gulf of Mexico. Daily production in the area fell from 650,000 barrels to 430,000 barrels, a company official said, losing Pemex close to $10m (£6.7m) a day. Pemex's director of exploration and production said it was difficult to restore production because of the large number of pipelines which had been affected. The fire broke out at the Abkatun A-Permanente complex in the Campeche Sound. One survivor described how workers had "jumped into the sea out of desperation and panic". It took eight firefighting boats to quell the blaze. Mexican President Enrique Pena Nieto said there would be a thorough investigation into what had caused the fire. Pemex said that while the accident had caused some oil to run off into the sea, a "considerable oil spill" had been averted. It took Pemex more than nine months to stop the leak, during which time the oil travelled as far as the Texas shoreline.